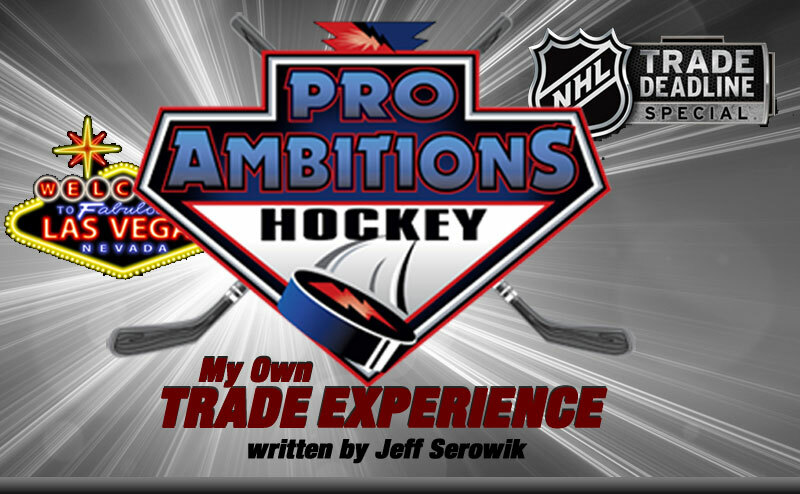 My Own Trade Experience - Pro Ambitions Hockey, Inc. I was only traded once in my ten year pro career. At the time I was not playing in the NHL, I was in the minors playing for the Indianapolis Ice in the IHL. The phone rang early in the morning, I was dead asleep as we had three games in the past three nights. My wife was with her family in Florida. Half asleep the GM of The Chicago Blackhawks, the parent NHL affiliate to the Ice, apologized to me and told me I had been traded. He said that I needed to get up and pack some clothes as I will need to catch a flight in a couple of hours to meet my new team on the road. He was matter of fact and right to the point. All I remember is thinking in my head….Oh no please don’t say I am going back to Newfoundland, better known as The Rock, or one of the other maritime islands in Canada. He said, you have been picked up by Vegas. The Las Vegas Thunder. I silently fist pumped in the air and muttered ok in a melancholy tone, I understand. I was not too far out of college, newly married without children. Vegas sounded pretty much awesome to say the least. I met the team in another city in the Midwest, it was a quick flight. Told my wife to fly back to Indianapolis and pack up our stuff and call the team to schedule a flight to meet me in Vegas in a few days. She had the exact same reaction as I did. It was pretty awkward meeting my new teammates for the first time because my flight had been delayed and they were all waiting for me on the bus for two hours. Not one of the guys looked happy to see me walk on that bus. I was comforted to see one or two familiar teammates’ faces whom I had played with during prior seasons here or there as I got an initial cold shoulder from the other defensemen. I wasn’t worried about it because there really is not a teammate in my history of the game who I have not liked. Hockey players are pretty much all great guys. Playing in Vegas was siiiick. To say the least I had the best trade experience. I have a feeling trades don’t typically go this well. I played a ton on the first penalty kill and power play and our team was on a roll. We ended up going all the way to the finals and losing in the final game. I was traded towards the beginning of the hockey season, we had a great better half of the season living in Vegas. The team put my wife and I up for the season in The Luxor hotel, with per diem daily meal money. We ate out every meal, got to know everyone in the hotel, hung out at the pool after practice, played a lot of blackjack, and saw a ton of shows. Oh, and I had the most visitors of my entire career. I don’t think there was a single weekend we did not have friends and family come out and take advantage of the team rate at the hotel. Also, it was almost more exciting than playing in the show in many ways. There were no professional sports teams in Vegas at the time, so The Las Vegas Thunder got a lot of perks. We did a ton of red carpet events with many celebrities coming into town from LA, we ate at Planet Hollywood free for the season. On days off we would drive to LA through the desert. It was a great hockey season on all fronts. I was lucky! Two words, VEGAS BABY! Big trades in the NHL are news worthy not my minor league to Las Vegas, I only wanted to share as I am not sure that many know how little notice players are given or how quickly you are gone. In my opinion the biggest trade of all time was Gretzky to LA from Edmonton. I am sure you agree. August 9, 1988 is known as THE TRADE. Fans in Edmonton wept and the media soaked it all in. Gretzky was off to the land of the movie stars coincidentally being newly married to an actress. Being a Boston guy and life long Bruins fan, another biggie for me was getting Cam Neely from Vancouver. How lucky we are to have had him and still have him. I am proud to call Cam a friend. He was one of the toughest, most skilled and charismatic players of all time. He had a huge heart and still does. I appreciate him reaching out to me as current president of the Boston Bruins to grow a grassroots effort outreach to young players in the Boston area and team up with Pro Ambitions Hockey, Inc. to facilitate the effort. Quick story about meeting Cam…I was a call up from the Providence Bruins. Team meal. I grabbed the pepper and unscrewed the top to pour a good amount on my steak. Apparently I forgot to screw the top back on. Cam used it next and the entire shaker poured onto his meal. He was not amused as he thought I was playing a rookie prank on him. We laugh about it still today. Here in Boston, we found out yesterday that Jagr is now a Bruin. He is another former teammate of mine and also is my pick for the greatest hockey hair of all time. He had the greatest mullet in history. Jags no longer has his mullet but he still has his moves. At forty one he is still kickin ice out there, racking up the points, making the plays happen and fighting the battles. For those of you who have not watched my history of hockey hair youtube video, feel free to click in from the home page of the website for a good chuckle. Jags, Welcome to Boston! Look forward to seeing players soon as summer is right around the corner. My Pro Amb Defense with Jeff tour is almost sold out, there are a few spots left at select locations. BU boarding and Hockey Surf boarding camps are also pretty close to capacity. The battle camp tour is pretty much hitting every US city this summer. Come and check us out and see what we are all about.